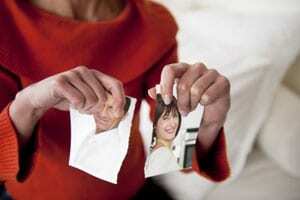 As a divorce coach, I hear one story over and over: infidelity. The person who stepped out on the marriage can be either male or female. In all cases, it seems, one person is left alone… distraught, confused, and scared about the future. Firstly and most importantly, know that you did nothing wrong. Do not feel guilty, apologetic, or ashamed. The infidelity was not your fault. Sometimes, we just have to accept what is. Perhaps, this bump (or maybe crater) in the road will provide you with future opportunities for love, for happiness, for growth. And, I promise, you will heal with time. You may, at times, need to fake a smile until it is real. This problem, while tragic, is not the end. Your real smile, expressing real joy, will come out again. Learn to practice gratitude for all that you have, whether it be a good friend, a roof over your head, or something other. Many states are now considered “no fault” in terms of divorce. Ask your attorney if this applies to you. If it does, it will not matter at all if one person had an affair. There will be no revenge in court for infidelity. As the song from the movie Frozen goes…Let It Go. This also can be applied to adultery in a no-fault divorce state (again, speak with your legal representation about your specific situation). This may be extremely difficult now but will certainly help you emotionally, which will in turn lead to the saving of both time and money in the divorce process. As your doctor will surely tell you… ”Get tested!” If there was infidelity, there is potential exposure to disease. Get tested and treatment, if needed. Before engaging in intimately with others, ask your new partner to also be tested and to share their results with you. If you can be close, you can be open and honest and share your concerns. If you have children, focus on your kids. Be the best parent that you can be. Let them remember you as doing the best thing for them during this very difficult time. Try to stick with the kids’ normal routines. Continue to (or even step up to) provide the love and reassurance that your children need during the family change. Also, do not speak poorly of your spouse to your kids. Kids do not need to know about adult topics in terms of infidelity. This person is still their other parent whom they love. Always act in the best interests of your children! Seek the help of a divorce coach, a therapist, or a support that will help you process the changes you are experiencing in your life. Do it for yourself and for your children. When you are ready, consider your role in the marriage. One person’s choice to be unfaithful is never your fault. But, as you move forward and consider other relationships, think about what you can learn from this one. Developing a mindset that is both forward-looking and positive may seem difficult right now, but this is what is needed to get through any major life change. You deserve to be happy. It’s your right and your responsibility to allow that possibility. Vicki Vollweiler and Cherie Morris are both Certified Divorce Coaches and co-founders of Dear Divorce Coach. How can I forget about it ? Trying out new things is always a thrill no matter what the state of mind is, at times one can go for casual meetings after settling down through the divorce, in that sense I would sugeest that websites like http://www.meetfems.com can help as well, one of my colleagues found that going on few casual dates helped to look at life in a new perspective.